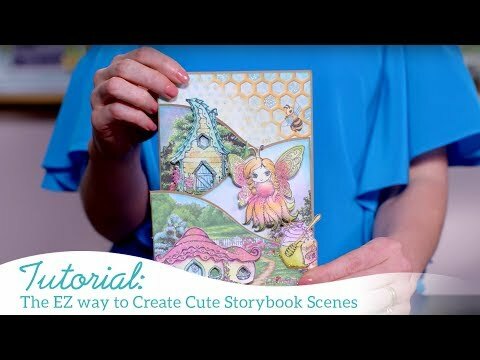 Watch this video for shaping and coloring tips and techniques on the Backyard Blossoms flowers: https://youtu.be/swO34-n1HNc. Instructions: Click here to view a larger photo of this project. Finished size of tag is 4" x 8". Cut patterned paper to match manilla tag, ink edges with bright tangelo ink and glue to tag. Punch hole and attach a yellow eyelet. Add some seam binding to tag. 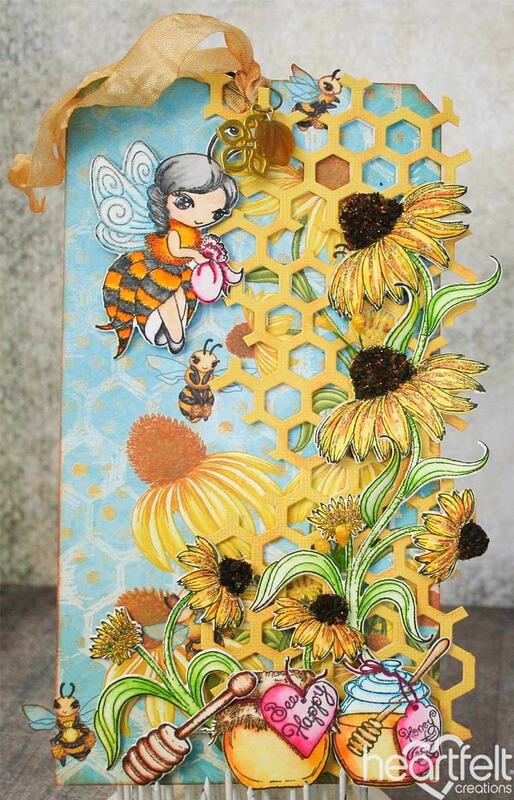 Using honeycomb die, cut a border from yellow cardstock and trim edges with scissors, using same die, cut the honeycomb shape from fun foam and cut apart with scissors, the foam will be used to give the cardstock dimension when gluing to the tag. Add glue to the foam and adhere to the back of the cardstock honeycomb diecut, add glue on the foam and glue to the tag as pictured. Stamp the images and flowers on watercolor paper with Onyx Black Versafine ink, cut with coordinating dies. Color images with Zig Clean color brush markers or your favorite watercolor paints. Shape all pieces slightly using the flower shaping kit. For the flowers I layered 4 of them with a second layer of petals to give them more dimension. Glue flowers and all images with foam dots for dimension. Apply Lion's Mane glitter to the petals of the flowers, Shell White glitter to the wings of the bee girl, and Redlands elements to the center of the flowers as pictured. Add a few bead stamens and attach a couple of charms to the seam binding.